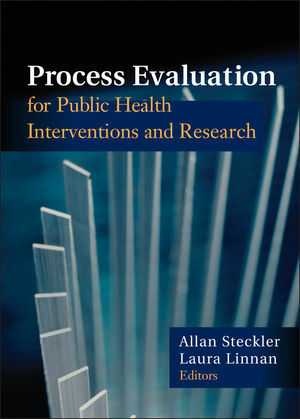 Allan Steckler is professor of health behavior and health education at the School of Public Health, University of North Carolina, Chapel Hill. Laura Linnan is an assistant professor of health behavior and health education at the School of Public Health, University of North Carolina. PART ONE: COMMUNITY-RELATED PROCESS EVALUATION EFFORTS. 2. Process Evaluation of an Asset-Based Teen PregnancyPrevention Project: Healthy, Empowered, and ResponsibleTeens of Oklahoma City (Michelle C. Kegler, Vicki Harris Wyatt, and Sharon Rodine). 4. Process Evaluation of the Adolescent Social Action Programin New Mexico (Deborah L. Helitzer and Soo-Jin Yoon). 5. Process Evaluation of the Church-Based PRAISE! Project:Partnership to Reach African Americans to IncreaseSmart Eating (Alice Ammerman). PART TWO: WORKSITE-RELATED PROCESS EVALUATION EFFORTS. PART THREE: SCHOOL-RELATED PROCESS EVALUATION EFFORTS. 8. Safer Choices, a School-Based HIV, STD, and PregnancyPrevention Program for Adolescents: Process Evaluation IssuesRelated to Curriculum Implementation (Christine M. Markham, Karen Basen-Engquist, Karin K. Coyle,Robert C. Addy, and Guy S. Parcel). 9. Using Children as Change Agents to Increase Fruit andVegetable Consumption Among Lower-Income AfricanAmerican Parents: Process Evaluation Results of the Bringing ItHome Program (Marsha Davis, Tom Baranowski, Marilyn Hughes, Carla L. Warneke,Carl de Moor, and Rebecca M. Mullis).